For the rebel group in Mali, see People's Movement for the Liberation of Azawad. 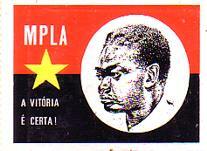 On December 10, 1956, in Estado Novo-ruled Portuguese Angola, the tiny underground Angolan Communist Party (PCA) merged with the Party of the United Struggle for Africans in Angola (PLUA) to form the People's Movement for the Liberation of Angola, with Viriato da Cruz, the President of the PCA, as Secretary General. Later other groups merged into MPLA, such as Movement for the National Independence of Angola (MINA) and the Democratic Front for the Liberation of Angola (FDLA). The MPLA's core base includes the Ambundu ethnic group and the educated intelligentsia of the capital city, Luanda. The party formerly had links to European and Soviet communist parties but is now a full-member of the Socialist International grouping of social democratic parties. The armed wing of MPLA was the People's Armed Forces for the Liberation of Angola (FAPLA). The FAPLA later became the national armed forces of the country. In 1961, the MPLA joined the African Party for the Independence of Guinea and Cape Verde (PAIGC), its fraternal party in Guinea-Bissau and Cabo Verde, in direct combat against the Portuguese empire in Africa. The following year, the expanded umbrella group Conference of Nationalist Organizations of the Portuguese Colonies (CONCP) replaced FRAIN, adding FRELIMO of Mozambique and the CLSTP, forerunner of the Movement for the Liberation of São Tomé and Príncipe (MLSTP). In the early 1970s, the MPLA's guerrilla activities were more and more reduced, due to the "counter-insurgency" campaigns of the Portuguese military. At the same time, internal conflicts caused the movement to temporarily split up into three factions (Ala Presicencialista, Revolta Activa and Revolta do Leste) – a situation which was overcome in 1974/75, but left profound scars. The Carnation Revolution in Lisbon, Portugal in 1974 established a military government that promptly ceased anti-independence fighting in Angola and agreed to hand over power to a coalition of three pro-independence Angolan movements. The coalition quickly broke down and the newly independent Angola broke into a state of civil war. Maintaining control over Luanda and the lucrative oil fields of the Atlantic coastline, Agostinho Neto, the leader of the MPLA, declared the independence of the Portuguese Overseas Province of Angola as the People's Republic of Angola on November 11, 1975, in accordance with the Alvor Accords. UNITA and FNLA together declared Angolan independence in Huambo. These differences reignited civil war between UNITA & FNLA and the MPLA, with the latter winning the upper hand. Agostinho Neto became the first president upon independence, and he was succeeded after his death by José Eduardo dos Santos in 1979. MPLA poster. The slogan translates as "Victory is certain". In 1974/76, South Africa intervened militarily in favor of FNLA and UNITA, and Zaire and the United States also heavily aided the two groups. Cuba deployed thousands of troops in 1975 to aid the MPLA against South African intervention, with the Soviet Union aiding both Cuba and the MPLA government during the war. In November 1980, the MPLA had all but pushed UNITA into the bush, and the South African forces withdrew. The United States Congress barred further U.S. military involvement in the country against the wishes of President Ronald Reagan, fearing another Vietnam-style quagmire. In 1976 the FNLA withdrew its troops to their bases in Zaire, while part of them joined the 32 Battalion formed by South Africa in order to receive anti-MPLA Angolans. At its first congress, in 1977, the MPLA adopted Marxism–Leninism as the party ideology and added Partido do Trabalho (Labour Party) to its name. After Nito Alves's attempted coup in 1977, Neto ordered the killing of suspected followers and sympathisers of "orthodox communism" inside and outside the party. During the coup, Cuban forces stationed in Angola sided with the MPLA leadership against the coup organizers. Estimates for the number of Nito Alves followers killed by Cuban and MPLA troops in the aftermath, range from 2,000 to 70,000 dead, with some placing the death toll at 18,000 killed. After the violent internal conflict called Fractionism, it made it clear that it would follow the socialist, not the communist, model. However, it maintained close ties with the Soviet Union and the Communist bloc, establishing socialist economic policies and a one-party state. Several thousand Cuban troops remained in the country to combat UNITA fighters and bolster the regime's security. In 1990, when the Cold War ended, MPLA abandoned its Marxist–Leninist ideology and on its third congress, in December, the party declared social democracy to be its official ideology. The MPLA emerged victorious in Angola's 1992 general election, but eight opposition parties rejected the election as rigged. UNITA sent negotiators to the Luanda, where they were killed. As a consequence, hostilities erupted in the city, and immediately spread to other parts of the country. Tens of thousands of UNITA and FNLA sympathizers were subsequently killed nationwide by MPLA forces, in what is known as the Halloween Massacre, and the civil war resumed. The war continued until 2002, when UNITA leader Jonas Savimbi was killed. The two parties promptly agreed to a ceasefire, and a plan was laid out for UNITA to demobilize and become a political party. Over 500,000 civilians were killed during the civil war. Human rights observers have accused the MPLA of "genocidal atrocities," "systematic extermination," "war crimes" and "crimes against humanity during the civil war." Rudolph Rummel, an analyst of political killings, estimated that between 100,000 and 200,000 Angolans died in the MPLA's democide between 1975 and 1987. In the 1992 elections, MPLA-PT won 53.74% of the votes and 129 out of 227 seats in parliament; however, eight opposition parties rejected the 1992 elections as rigged. In the next election, delayed until 2008 due to the civil war, the MPLA won 81.64% of the vote and 191 out of 220 parliamentary seats. In the 2012 legislative election, the party won 71.84% of the vote and 175 of 220 parliamentary seats. The MPLA government of Angola has been accused of human rights violations such as arbitrary arrest and detention and torture by international organisations, including Amnesty International and Human Rights Watch. In response, the MPLA hired Samuels International Associates Inc to help improve Angola's global image. At present, major mass organizations of the MPLA-PT include the Organização da Mulher Angolana (Angolan Women's Organization), União Nacional dos Trabalhadores Angolanos (National Union of Angolan Workers), Organização de Pioneiros de Agostinho Neto (Agostinho Neto Pioneer Organization), and the Juventude do MPLA (Youth of MPLA). During both the Portuguese Colonial War and the Angolan Civil War, the MPLA received military and humanitarian support primarily from the governments of Algeria, Bulgaria, East Germany, Cape Verde Islands, Czechoslovakia, the Congo, Cuba, Guinea-Bissau, Morocco, Mozambique, Nigeria, North Korea, the People's Republic of Poland, China, Romania, São Tomé and Príncipe, Somalia, the Soviet Union, Sudan, Tanzania, Libya and Yugoslavia. While China did briefly support the MPLA, it also actively supported the MPLA's enemies, the FNLA and later UNITA, during the war for independence and the civil war. The switch was the result of tensions between China and the Soviet Union for dominance of the communist bloc, which almost led to war. ^ "Experienced Hands Emerge to Steady Angola". Stratfor. ^ Africa Year Book and Who's who. 1977. p. 238. ^ Tvedten, Inge (1997). Angola: Struggle for Peace and Reconstruction. p. 29. ^ John Marcum, The Angolan Revolution, vol. I, The Anatomy of an Explosion (1950–1962), Cambridge/Mass. & London, MIT Press, 1969. ^ Benjamin Almeida (2011). Angola: O Conflito na Frente Leste. Lisbon: Âncora. ISBN 978 972 780 3156. ^ Rothchild, Donald S. (1997). Managing Ethnic Conflict in Africa: Pressures and Incentives for Cooperation. Brookings Institution Press. pp. 115–116. ISBN 0-8157-7593-8. ^ Georges A. Fauriol and Eva Loser. Cuba: The International Dimension, 1990, p. 164. ^ Sulc, Lawrence. "Communists coming clean about their past atrocities", Human Events (13 October 1990): 12. ^ Ramaer, J. C. Soviet Communism: The Essentials. Second Edition. Translated by G. E. Luton. Stichting Vrijheid, Vrede, Verdediging (Belgium), 1986. ^ Pawson, Lara (2014-04-30). In the Name of the People: Angola's Forgotten Massacre. I.B.Tauris. ISBN 9781780769059. ^ National Society for Human Rights, Ending the Angolan Conflict, Windhoek, Namibia, July 3, 2000. ^ John Matthew, Letters, The Times, UK, November 6, 1992 (election observer). ^ Madsen, Wayne (2002-05-17). "Report Alleges US Role in Angola Arms-for-Oil Scandal". CorpWatch. Archived from the original on 5 January 2008. Retrieved 2008-02-10. ^ National Society for Human Rights, Press Releases, September 12, 2000, May 16, 2001. ^ "Angolan ruling party gains about 82% of votes in legislative race". Xinhua. September 17, 2008. ^ "Eleicoes Gerais 2012: Resultados". Comissao Nacional Eleitoral Angola. Retrieved November 29, 2012. ^ "UN reports Angola 'torture' abuse". BBC News. 2007-09-28. Retrieved 2007-09-28. ^ Angola. Human Rights Watch. ^ "How a U.S. agency cleaned up Rwanda's genocide-stained image", The Globe and Mail. ^ Howe, Herbert M (2004). Ambiguous Order: Military Forces In African States. p. 81. ^ a b Wright, George (1997). The Destruction of a Nation: United States Policy Towards Angola Since 1945. pp. 9–10. ^ Nzongola-Ntalaja, Georges; Immanuel Maurice Wallerstein (1986). The Crisis in Zaire. pp. 193–194. ^ "Angola-Ascendancy of the MPLA". www.mongabay.com. Retrieved 2017-07-06. ^ China Study Centre (India) (1964). China Report. p. 25. ^ Walker, John Frederick (2004). A Certain Curve of Horn: The Hundred-Year Quest for the Giant Sable Antelope of Angola. p. 146. ^ Nzongola-Ntalaja, Georges; Immanuel Maurice Wallerstein (1986). The Crisis in Zaire. p. 194. David Birmingham, A Short History of Modern Angola, Hurst 2015.